BISS Silver GCH. Silhouette's Dirty Harry--Got Select at Westminster Kennel Club on 2-16-16 with Shawn Imler as the handler! Very Proud! Thank you Shawne and Sue Descano for letting this all happen!!! Harry has a beautiful coat and a nice top line and neck. He has good stucture and glides in the ring and is fun to watch. He loves to show and barks at ringside to want to show. He has a great personality and loves everyone. Harry and Carol Filer Handler with judge Francine W. Schwartz. 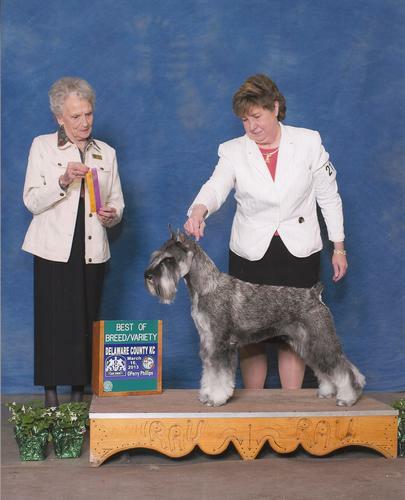 Best of Breed and 5 GCH points to finish his Grand Championship at Old Dominion Kennel Club of Northern Virginia on 4/20/2013. Thank you Francine Schwartz and Carol! 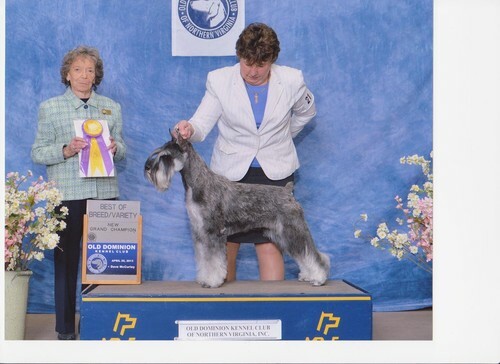 Harry and Carol at Deleware with Best of Breed with judge Beth G. Speich on 3/16/2013. Thank you Beth Speich and Carol!